*You will not be able to charge an entry fee through 18Birdies for this League Tournament with a LITE setup. In order to do so, see the Creating a MAX Tournament in Leagues article. Start Date - If you are creating your tournament days or weeks ahead of the actual play date, choosing the correct start date may have an effect on how your invited tournament players will be allowed to access their tournament round(s). If you as the organizer of the tournament are planning to control the adding/removing of players from teams, then choosing the actual start date of your tournament or just leaving it as the date of the tournament creation really does not matter. On the other hand, if you are creating a tournament where team captains will have the permission within the app to add/link players to their team, you'll want to make sure you choose the actual true start date of your tournament, otherwise they may have the ability to start their tournament round early or before you wish. End Date - The end date marks the conclusion of your tournament. After 11:59 PM your local time of the end date you choose here, this tournament will move out of your Live & Upcoming Tournaments section and move down to the Tournament History section. Remember that if a tournaments end date has passed and it is listed in the Tournament History section, you will have no access to the invitations tab, team assignments tab, or ability to edit scores. In the case of a weather delay or other special circumstance that pushes back the date of your tournament, after you finish the setup process and you are in the Tournament Management side, you will be able to edit the originally chosen End Date within the Settings tab. You will want to be sure to do this before 11:59 PM your local time on that day to prevent from being locked out of the majority of the Tournament Management functionalities. Tournament Course - Once you enter the course name and select it, you will see a link appear to View Course Details. You may wish to open this link to take a quick peek at the course scorecard and other details to make sure they are accurate before you complete the setup of your tournament. If you find an error, you can click the 'email us' link at the bottom of this window to contact support. By choosing this option, only members of the League will be able to join this tournament. Note that this setting cannot be changed after the setup of the tournament is completed. By NOT choosing this option, you are allowing Non-Members of this league to join the tournament. Keep in mind that you are setting up a LITE tournament, and app users will not see this tournament as available to them in the 18Birdies app, so unless you send a user an invitation, they will not have the means to join the tournament. Choose either 18 or 9 holes (front or back) for your tournament. Keep in mind that if you were to create a multiple round event, the round type you choose here will apply to each individual round. Choose the tees that your tournament players will be competing from. You have the ability to choose a tee box for Men and Women. Once you do so, you will see the corresponding slope rating assigned to that set of tees. This slope rating is what will be used to convert each player’s Handicap Index to a Course Handicap for their tournament round(s). You have the freedom to edit these slope ratings in order to adjust the converted Course Handicaps for your tournament players. NOTE: If for any reason the tees available in the drop-down menu are not accurate to your courses scorecard, please contact the 18Birdies support team by clicking Contact Support from the Information menu in the upper right corner of your screen. This allows you to edit hole handicap and par values on the tournament scorecard. Select this option and the tournament scorecard with the chosen tees will appear in a pop-up window. You can freely edit the par values or hole handicap values for Men and/or Women. Keep in mind that these changes will only be effective during this tournament. Make sure to Save! Sequential Tee Times - Choose this option if you are running a tee time event. Check the Tee Time box to choose the first starting time and the time interval between tee times. Shotgun - If choosing Shotgun, you have the option to check the Tee Time box to associated a starting time to your Shotgun event. Individual Stroke Play - In this format, players compete individually and are ranked on the Leaderboard by Gross and/or Net scores to par, depending on your Leaderboard settings. 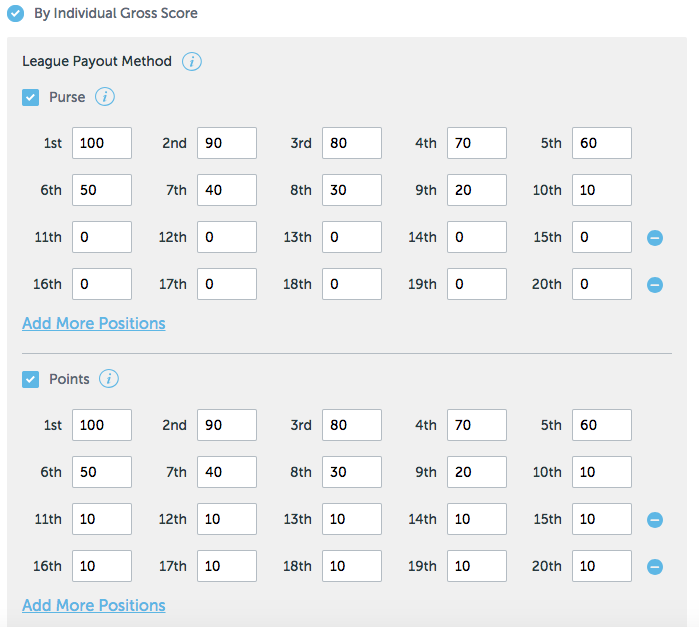 Team assignments are treated as pairing groups with this format and have no effect on individual players scores. Stableford - Stableford format applies a point value to a player’s score on each hole. As Stableford is more of a scoring mechanism than a format of play, the Stableford point system only applies to individual players, meaning that if you choose Stableford format your tournament players will be playing an Individual Stroke Play format with the scoring on the Leaderboard displayed in points instead of the score to par. Team assignments are treated as pairing groups with this format and have no effect on individual players scores. Regular vs Modified Variants: The Regular option uses the default point values for Eagle, Birdie, Par, etc. Choose Modified if you wish to adjust the point value associated with each hole score. Best Ball - Each tournament player plays his/her own ball from tee to green throughout the round. The team's total score on each hole is calculated by taking the lowest Gross and/or the Net score of the team (adding the lowest 2 or 3 lowest scores if you choose 2 or 3 balls count). Teams must have 2 players or more. Scramble - Each player on a team hits his/her own tee shot, they select the best shot of the team off the tee, then all hit their second shot from that spot. This format is followed until one player on the team holes out. Teams created must be of 2 players or more. Individual Stroke Play + Best Ball - This format combines the Individual Stroke Play and Best Ball formats. The main difference is that Gross and Net Leaderboards become available for both Individual Stroke Play and Best Ball games in the Leaderboards tab. Choose whether or not you would like to Flight your tournament by choosing Enable or Disable. Flights are only available for the Individual Stroke Play and Individual Stroke Play + Best Ball formats. Player's Full Handicap - Choosing this mode allows each tournament player to play at the full value of their converted Course Handicap. Cap at a Max Value: When selecting either “Full Handicap” or “Percentage of Handicap” you can choose to 'cap' Course Handicaps. A cap is the maximum course handicap value that any one player’s handicap index can be converted to. You can choose a different cap for Men and Women. Percentage of Handicap - If you would like each player to play at a percentage of their full course handicap (between 5 and 95%), you can do so with this option. Simply click the drop-down menu and choose the percentage you wish to assign. You can choose a different percentage for Men and Women. Cap at a Max Value: See 1a above. 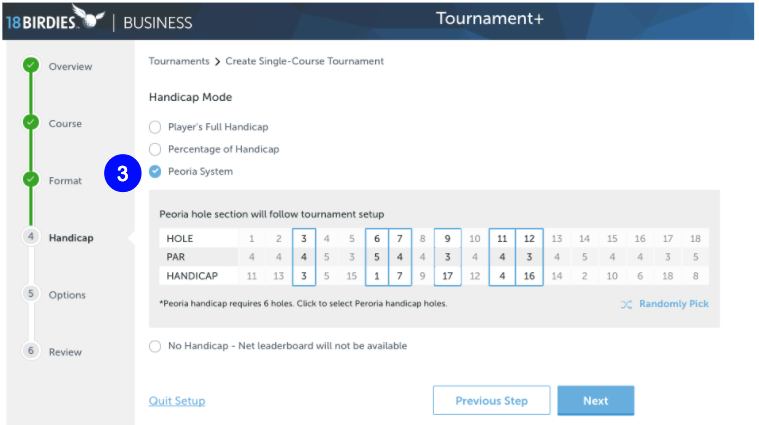 Peoria System - The Peoria System uses a player’s performance during their tournament round to establish a course handicap for that specific tournament. As the organizer, you need to choose six (6) holes that will be used to calculate the course handicaps. You can manually click 6 holes or click “Randomly Pick” to let the software choose for you. On each hole that is chosen, the amount over or under par (with a maximum of double bogey) is summed, and the total is multiplied by three (3). This number acts as the golfer's Peoria Handicap. NOTE: The holes you selected will not be visible to the tournament players until you choose "Reveal Peoria Holes" in the Leaderboards tab. Also, if you are displaying a Gross and Net Leaderboard, each player’s name and score will not appear on the Net leaderboard until that player has completed all 6 of the Peoria holes you’ve chosen. Tip: Many tournament organizers using the Peoria System choose one par 3, one par 4, and one par 5 on each side to make up the six Peoria holes. No Handicap - If you choose No Handicap, you are choosing to run a Gross tournament only and a Net Leaderboard will not be available. Scramble Handicap - *Only applies to Scramble format tournaments. When playing a Scramble tournament, you can either choose No Handicap, where the team score is not adjusted at all or a Scramble Handicap. A Scramble Handicap allows you to apply a specific percentage to each player’s Course Handicap on the Scramble team. The percentage applied will be based upon the order of Course Handicaps from lowest to highest. The actual Scramble Handicap will be the sum of the reduced Course Handicaps and will apply to the total team Gross score and appear as an adjusted score on the Leaderboard. 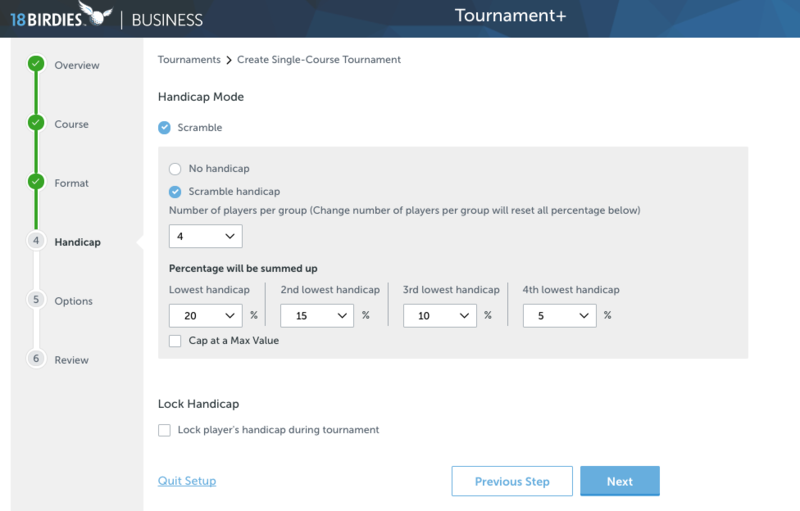 If you choose to use a Scramble Handicap, be sure to click the drop-down menu to choose the number of players you are going to assign on each team. Firstly, choose whether you wish to allocate points and/or purse by Gross or Net scores for this tournament (just check the boxes!). Do not join league standing option - If you enable this option, the points and/or purse for this individual tournament will not factor into the Season standings. USGA recommended method - Ties will be broken using the best score on the last nine holes. If players or teams are still tied, it will try the last six holes, then the last three, and finally the 18th hole. Hole 1, going forward - Ties will be broken using the best score starting on hole one, then proceeding to holes two, three, and so on until the tie is broken. Hole 18, going backward - Ties will be broken using the best score starting on the 18th hole, then proceeding to hole 17, 16, and so on until the tie is broken. Hardest handicap hole, then easier ones - Ties will be broken using the best score starting on the hole with the lowest hole handicap, then if still tied proceed to the next easier one, and so on until the tie is broken. No Tiebreaker - If you do not plan to break ties, or maybe you are performing an on-course playoff, choose No Tiebreaker. Note: The Auto Tiebreaker does not go into effect on the Leaderboard until the end date of your tournament has passed. This means that if you are displaying your leaderboard in the clubhouse or grill on the same day of the event after players have finished, ties will not break automatically. You will need to manually perform the scorecard playoff and adjust the positions of players or teams manually using the pencil icon on the Leaderboard. Full Access - Players will have full access to GPS+ features within the 18Birdies app. Premium members will have access to elevation, wind speed, and direction, temperature, as well as Caddy+ club recommendations. Limited Access - Players will have access to distances only. This includes front, middle, and back of the green, as well as a movable target on the GPS screen that can be used to determine the distance to a target in the fairway or hazards like bunkers and out of bounds areas. No Access - Players will have no access to the GPS screen. If they tap 'GPS+', they will see a blank screen that informs them GPS has been disabled for the tournament. If you would like to allow a peer or subordinate to manage this specific tournament, you can add them as a Tournament Supporter here. You will first need to make sure they have their own 18B|B User Profile so they can get logged in to the 18B|B platform and access Tournament+. See the User Profile & User Management article here for more information on that. Once you have the user profile you wish to add as a Tournament Supporter created, you simply need to start typing their name into the available field. When their profile appears, click the profile to add them. They will then be able to login to their 18B|B account and access this tournament that you created on their personal Tournament Dashboard. With each tournament you create, you have the option to add an additional Skins game. The format you choose for your event will determine what Skins game(s) is available for you to run. For example, if you run a Scramble format tournament, a Scramble Skins game will be an option for you to enable. When you enable a Skins game, you are essentially turning on access to additional Skins Leaderboards, gross and/or net depending on your handicap settings. Note: Currently Skins games apply to the entire field. If you enable a skins game, there is no way to allow a player to "opt out" of the skins competition. Skins Carryover - As soon as you check the box to enable a skins game, you will be presented with an option to enable carryovers. An example of a Skins game with carryovers enabled is all players tie on holes 1, 2, and 3, and then one player has the lone lowest score on hole 4. This player will win 4 skins, one skins for each hole that was tied, or "carried over" to hole number 4. Without carryovers enabled, the skin won on hole 4 will only be a win of 1 skin. Skins Handicap - If you wish to assign a percentage of course handicap for players compete to specifically for the Skins competition, you can do so here. Note that this adjustment only applies to the Skins competition and is not applicable to Scramble format tournaments. Every team/pairing group has an associated 'team name'. This is editable within the Team Assignments tab just above each team of players. Keep in mind that the team name only factors into Leaderboards of team competitions (Best Ball and Scramble). If you choose to enable team name editing, players on a team/pairing group will be able to edit their team name within the app. If you leave this unchecked, you will be solely responsible for editing each team name.